This lovely vintage penannular design was designed by Robert Allison. It is beautifully cast from the finest sterling silver; the penannular measures 1-5/8" (42mm) and the pin is 1-7/8" (48mm). The very first brooches of this kind date back to the eighth century. The ancient Celtic people were the first to devise a way of pinning garments together. The Penannular or open ring brooch is among the most ancient of jewellery worn with articles of clothing. 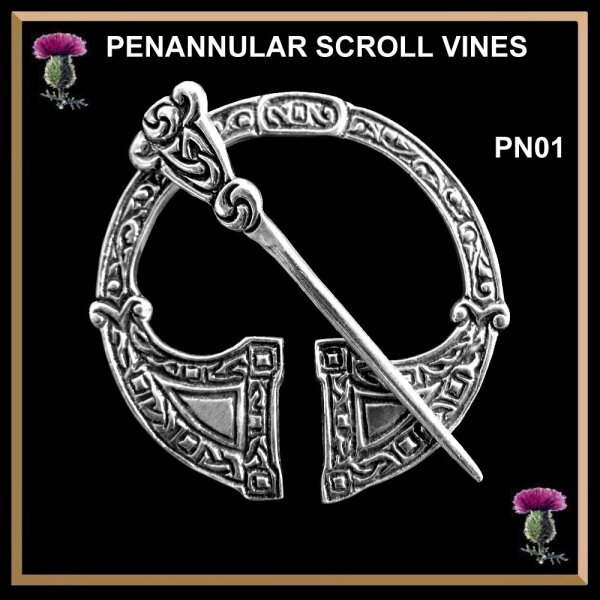 This stunning penannular brooch is perfect for ladies' dress wear, on a sash at the shoulder, on a fine scarf or shawl, or on a kilted skirt (instead of a long pin). A timeless design for the millennium worn today as in centuries past. With the ring of the pin upside down, push the pin of the brooch through the fabric of the the scarf, shawl, cloak or wrap, picking up a couple of layers. Flip the ring portion of the brooch over, so that the open ends are aligned with the end of the pin. Bring the end of the pin through the gap and above the terminals, then rotate the ring until the end of the pin moves past the terminals, and is secure on the fabric.